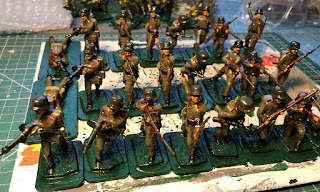 Bertrand and I have a plan underway for a Verdun game, so I recently completed this batch of 1916 Germans. 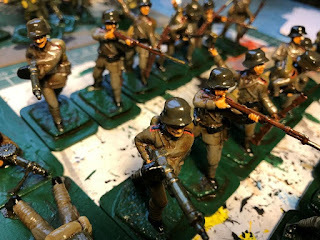 These are Armies in Plastic 1/32 figures, mostly as they came out of the box, though note the two prone chaps with captured Lewis guns. The photos were a bit rushed and taken when the varnish (Ronseal satin light oak) was still tacky. 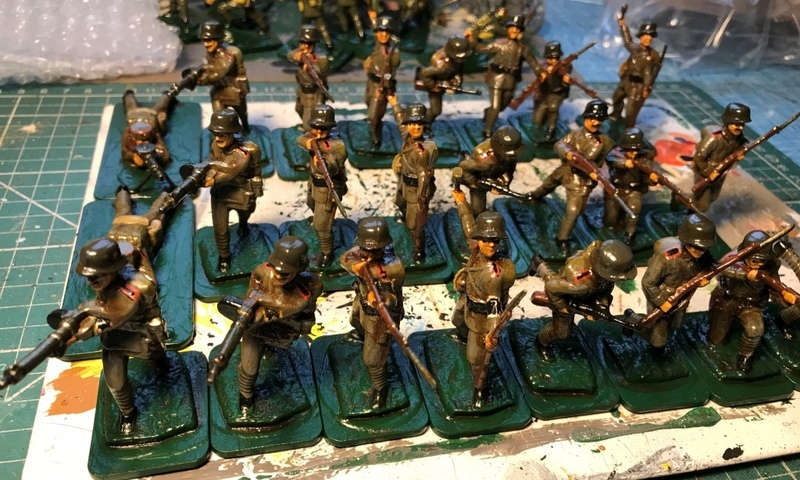 The chaps in the front company (sorry, Kompanie) are wearing the 1916-issue 'S' (for Stosstruppe) armbands. Sad but true. They look very nice Tim. I look forward to seeing how the rest of the project develops. Perhaps set in a sandpit for appropriate fortifications? I have a few more things to paint, but we chose Verdun as we already have most of the kit. Fort Douamont is already under construction. No children’s sandpits have been appropriated. The Cold War - again!